Snake My Charms is the debut album of five weirdoes from Sweden who call themselves No Hawaii. Judging by the reviews that have cropped up in the far corners of the internet, the common consensus is they're best compared to Isis and Cult of Luna. This writer has never heard a single note from those bands so he approached Snake My Charms with a fresh set of ears. What greeted him upon 'play'? Odd songs in general, and some Nintendo music, a lot of death metal too (frontman Biggus is quite the mean growler). The fourth track of the album is empty, as in zip�no music. Meaning a waste of your time. Snake My Charms gets underway with a decent enough opener introducing the manifold genres that comprise No Hawaii's repertoire. Don't worry, they just sound strange but aren't complex to the nth degree. The problem here is most of the muzak is boring and you don't want to sink your teeth on such hefty numbers as Chuck Noir, the cacophonous Isaul, the immense Radio Magellanes, or the chilled segue Technical Difficulties, and the oddball anthem Unleash the Kuru. Oh wait, backtrack a bit�you do want to sink your teeth on Technical Difficulties. It's heaps of fun. It frees your mind from pain and makes you want to dance. Don't miss the Nintendo-themed ambient album closer E=MC2 as well. In fact, Snake My Charms' last gasp of music has to be this writer's favorite. Maybe it's because he finds No Hawaii pretentious and doesn't 'get it', whatever. E=MC2 is a soothing four minute farewell that ends the ride on a happy note. The same praise doesn't apply to the other songs. 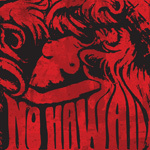 For the rest of mankind, No Hawaii is an acquired taste. Listen to them at your own risk. No Hawaii's Snake My Charms is an acquired taste. Listen to them at your own risk.